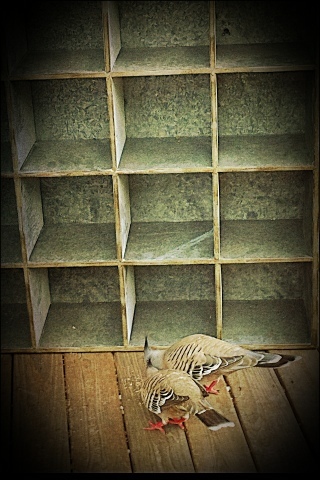 Our Crested Pigeons [Ocyphaps (Geophaps) lophotes] had to check out the new galvanized shelves. They have two chicks and the adults are incredibly bold, wandering among the humans, dog, chickens and the cockatoos who hang out on this verandah. They are delightful, Judy, so trusting. The chicks just started flying this weekend. Our crested wood doves walk across the road rather than fly, and the seed we throw for the birds bounces off their backs since they refuse to move. I love their subtle colouration. EC, I can't believe how calm they are. They come within inches of us then look affronted when we make a sudden move.